Antique jewelry Victorian rose cut diamonds brooch: Description by Adin Antique Jewelry. COUNTRY OF ORIGIN : Although it does not carry any legible control marks we believe it is of Belgian origin. TECHNIQUE : Silver on gold. This technique finds its origin centuries ago, when jewelers believed that only a silver mounting could render the true beauty of a diamond. 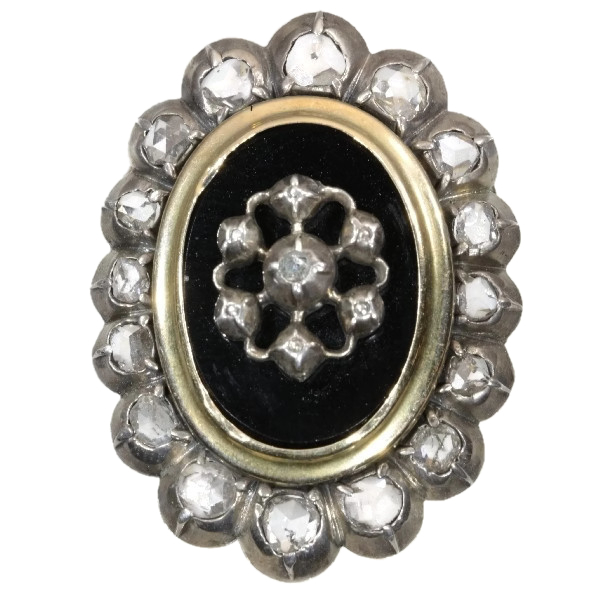 Backing the silver jewel with a (thin) layer of gold was a practical precaution taken to avoid the silver jewelry leaving black stains on clothing or skin. Over the years, with the recognition (and thus use) of platinum as precious metal and the development of white gold the practical necessity to use bi-colored material became obsolete. The argument to use bi-colored metals became more an estetic then a practical one. DIAMONDS : 17 rose cut diamonds. We do not have the weight of the diamonds which is normal in our trade when it comes to rose cuts. WHEN REFERRING TO THIS PIECE : Mention the following number: 01288-1917 or click here.